When Chris Eng stands behind the cluttered cash desk at Page and Panel, the Toronto Comic Arts Festival bookshop, he often nods mid-way through a customer’s question. The author and micro-press publisher already knows the answer, but he’s going to wait, unhurried West Coast style, for the person to finish. The Victoria, B.C., transplant was a journalist, music magazine editor, and campus radio host in Victoria and Vancouver before moving to Toronto four years ago. Working as a clerk at Page and Panel enables Eng to share his extensive comics knowledge and also devote time to writing and publishing books through his HoodieRipper Press. Eng may also be the first Canadian author to write extensively about K-pop. 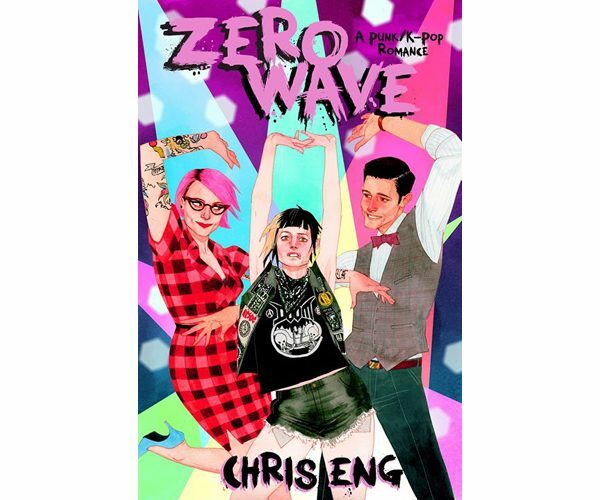 ZeroWave, his second teen punk romance, is about a West Coast punk teen secretly obsessed with Korean pop music and struggling to find her place in the world. Eng released the book in May with launches in Toronto, Victoria, and Vancouver. Like his 2013 debut, Molotov Hearts, it’s set in the fictional Pacific Northwest city of Westport (which he admits is very much like Victoria), but he wrote the new book for a slightly older demographic: new adult instead of young adult. Eng, who discovered punk in Grade 6 and attended his first punk show with a forged ticket, is establishing himself as a DIY author on his own terms with HoodieRipper Press. He admits he’s always had an anti-authoritarian streak, so it makes sense for him to maintain creative control. He also has a clear vision. HoodieRipper books are about love and self-acceptance. After watching all the punk movies, like Sid and Nancy and Suburbia, Eng decided not everyone has to die at the end of a punk story. He wanted to write something more like real life. “I’ve had friends die, but not most of them. Most of my friends fell in love. Some of them stayed together, some of them broke up and that’s life,” he says. Eng’s next HoodieRipper punk romance novel is planned out and he’s also begun writing a new action adventure series about a punk rock band. For now he’s focusing on publishing his own books under HoodieRipper Press, but may expand to publish other authors’ books in the future, provided they fit the same punk spirit.